A light dusting of snow. I am trying to act as if this is a good thing, but I am done with snow this year. It has made a mucky, muddy mess of our area (an area that rarely gets snow) and the county has been ill-equipped to deal with its’ effects. Blech. Where is spring? Of a sweet friend going through a move herself. Praying for her and her sweet kiddos- it’s been a tough season for them. Banker’s boxes. New beginnings. Bigger rooms and places to run, a real, actual kitchen with a window over the sink. Space to breathe. For my wonderful, amazing husband, jack of all trades, mover of all things heavy. We got wonderful news about his job Friday, so to say we are over the moon right now even in the midst of moving chaos is just about right. You know, I’m excited. We sort of got into this buy frozen family meals type routine the last two or three weeks in all the craziness of James moving to second shift. It always helps, but I am ready to cook again. And in a nice kitchen to boot! We’re only renting, but it feels a bit like Christmas right now. Jeans and t-shirt. Only notable because the last few weeks I have been living in sweats. Not exactly on purpose, but when my days started early and ended late, I often would look down at three in the afternoon and realize I never got “dressed”. Going to try to change that trend after the move is over. Mess upon mess upon mess. I can’t believe how messy the kitchen was- and I am very diligent in making sure it is cleaned top to bottom at least once a week. Blech, blech, blech, yuck. Thoroughly grossed out. To not miss all the *loud* traffic that files past our house each night. We are moving to a lovely barn house in the middle of the country with fantastic, amazing, over the top (yes, I will take pictures and share) views of the mountain ridge. Where it is blissfully *quiet*. That this move goes well, that the kids find the transition somewhat smooth, and that the family moving into this house will be blessed. Josiah babble and talk, and blow rassberries. He’s suddenly discovered he can make noise, and it is so funny to watch him feel out the sounds in his mouth. We live to make him laugh right now- what’s sunnier than a baby giggle? He definitely brightens our days. You know, I’ve purged and purged and purged the last two years, and I am still amazed and the simple amount of stuff- equipment- that it takes to manage and run a large family. I don’t know how extra large (10+) families travel, let alone move. 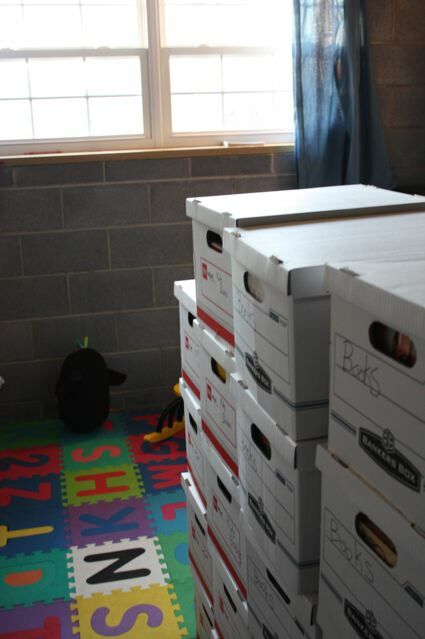 I am overwhelmed at the amount of things needed just on the first day to keep the kids going in the midst of the move! Nursing. I have passed quite a milestone today- 7 months. Well, so has he for growing, but I digress. This is the longest I have gone breastfeeding, with no signs of stopping so far. I wonder why it took me till number five to finally “get” it…the times we have together are sweet and quiet in the midst of noise and messes. A peaceful place. Did someone give you all those books??? You are a woman after my own heart!!! I love you! Wow, how did God know I needed to hear this today? I am at a similar place…we are selling and moving to the country, to a bigger but older home, renting instead of buying for a season. It’s hard but I know God is in the midst of all of it. I need to focus on the quiet and peace we will have (financially as well) after the chaos is over. Right now, I tend to focus on the chaos and get discouraged. Thanks Dena. It’s been quite an adventure, that’s for sure. Congratulations on the High Calling gig!